Asmara does not ship to your selected country. 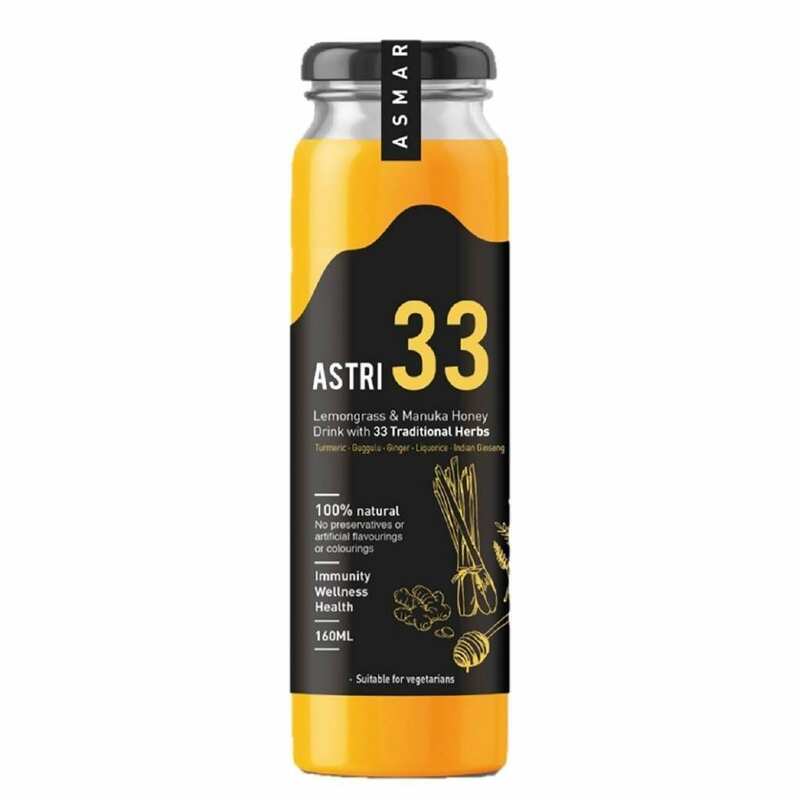 Astri 33 is a refreshing and soothing beverage made from lemongrass, manuka honey, fresh lime extract, pandan extract, and 33 different TCM, Jamu, Ayurvedic, and Western herbs. 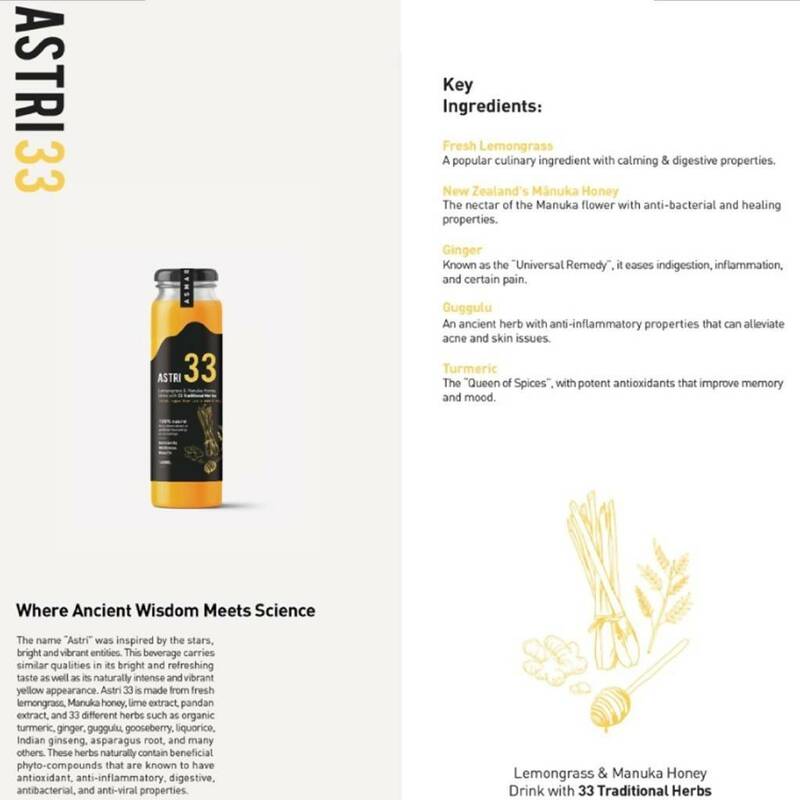 Some of the herbs would include turmeric, ginger, gooseberry, liquorice, Indian ginseng, and asparagus root. 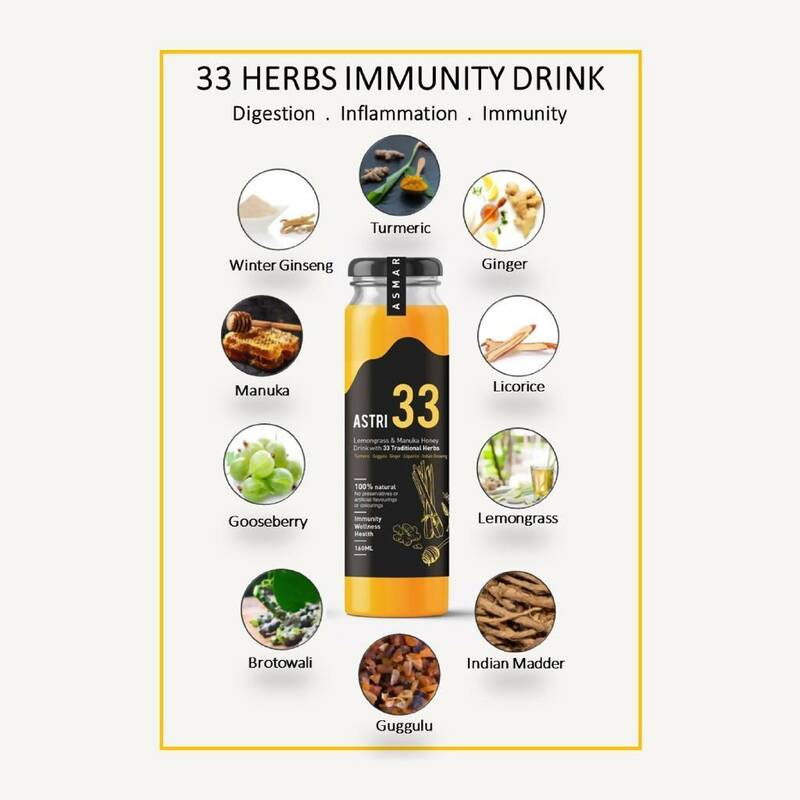 These herbs are naturally known to contain beneficial phytochemicals that have antioxidant, anti-inflammatory, antibacterial, and antiviral properties. Therefore, they naturally influence our immunity, skin health, digestion, and general well-being. A product of Singapore. 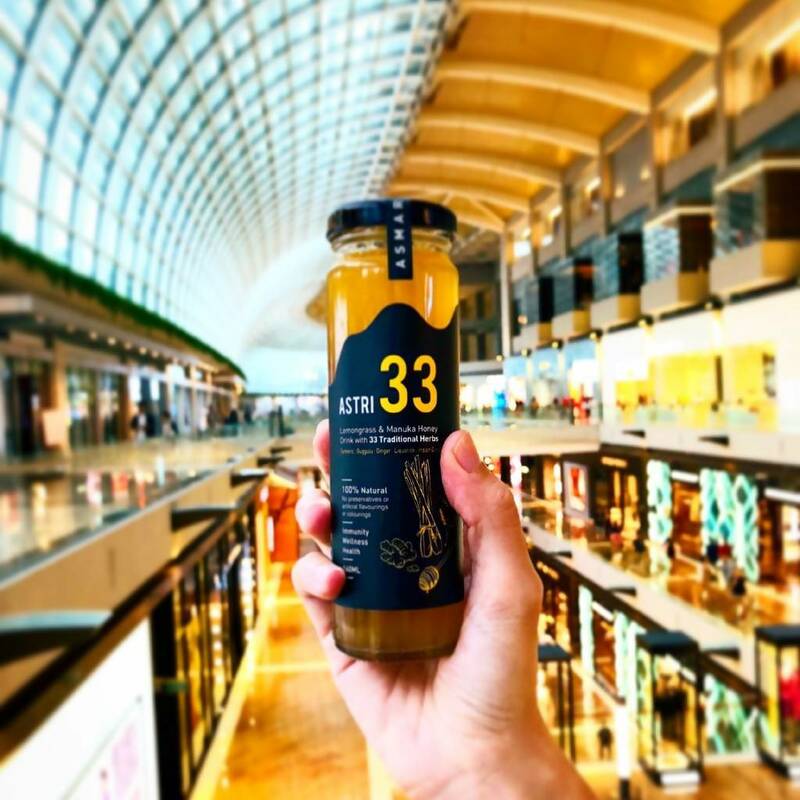 The beverages are brewed in an AVA, ISO 22000:2005, HACCP, and Halal certified facility in Singapore. – Consume 1/2 or 1 bottle per day. – Shake well before opening. – Can be served at room temperature or chilled. – Refrigerate after opening & consume within 1-2 day(s). – Unopened bottles can be kept at room temperature for 12 months. – Suitable for older children, adults & vegetarians (contains honey & bird’s nest). – Manufactured in a facility that uses: bird’s nest, honey, herbs, soybean & nuts. 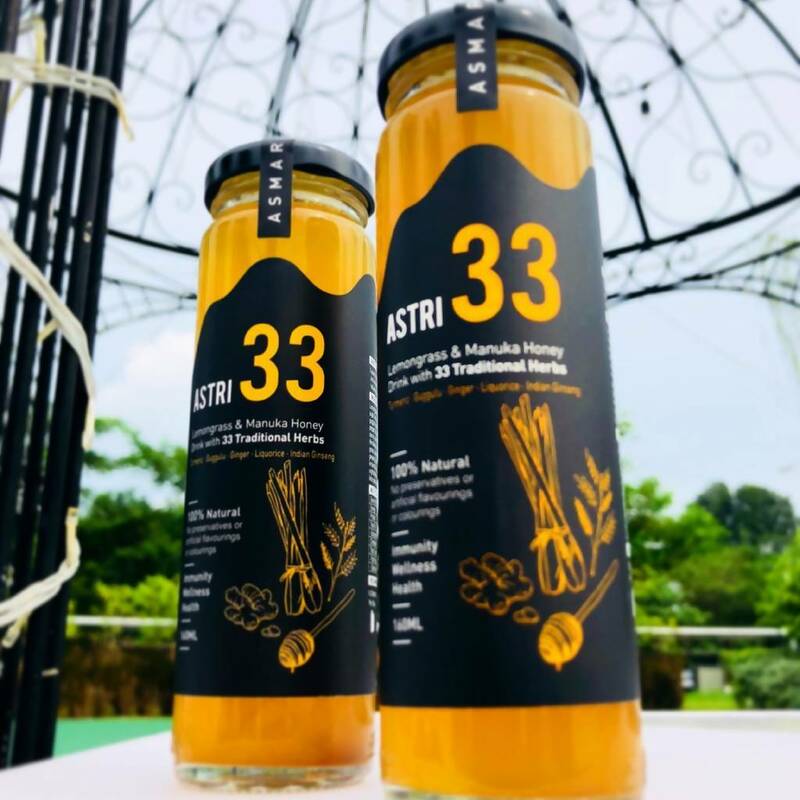 – Herbal: not suitable for pre-schoolers & pregnant / breastfeeding mothers. – If you have a medical condition, consult your doctor / dietitian first. 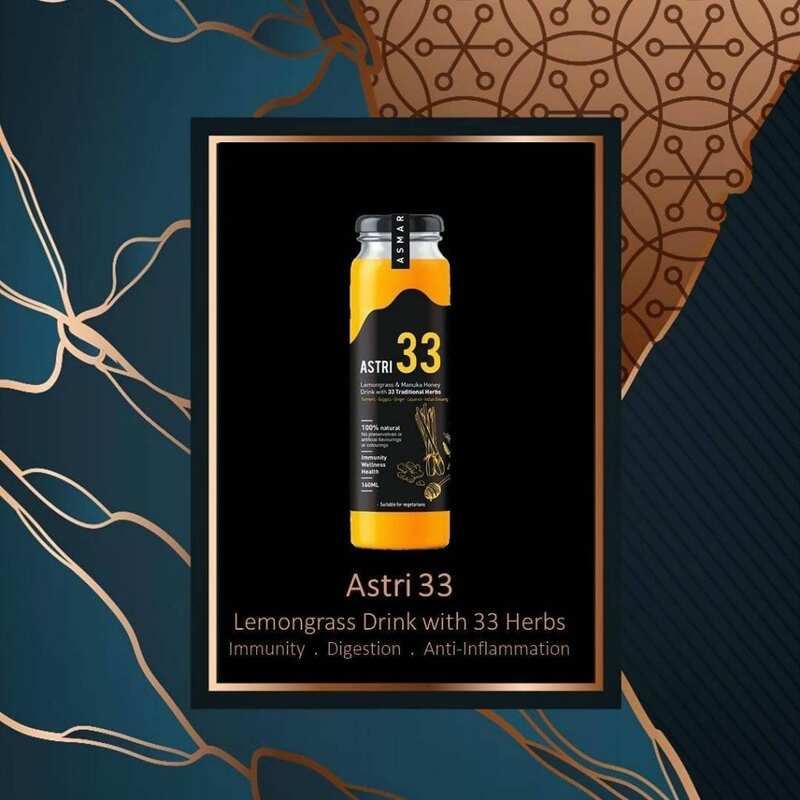 Ingredients: Fresh Lemongrass, Lime Juice, Pandan Leaf, Crystalized Honey Sugar, Manuka Honey UMF5+, Lime Peel, Turmeric, Ginger, Natural Guggul Gum, Indian Madder (Manjistha), Tinospora (Guduchi), Black Pepper, Long Pepper Fruit, Javanese Long Pepper, Indian Gooseberry (Amla), Liquorice, Bellirica Fruit (Bibhitaki), Chebula Fruit (Haritaki), Tribulus Fruit (Gokshura), Indian Ginseng (Ashwagandha), Inula (Pushkarmool), Himalayan Cedar, Castor, Ginger Lily Root, Punarnava, Barleria, Coco Grass Tuber, Cassia, Malabar Nut Tree Leaf, Shatavari Root, Indian Fagonia, Vidari Kanda Tuber, Dill, Coriander, and Natural Gum.